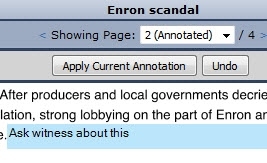 You can access the Annotation section from the Document Viewer>Doc Tab. You can annotate or highlight PDF images or files opened in the Document Viewer Annotation. 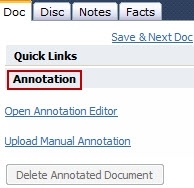 This feature allows you to either annotate/highlight documents directly or manually upload documents previously annotated to you cases in Lexbe eDiscovery Platform. 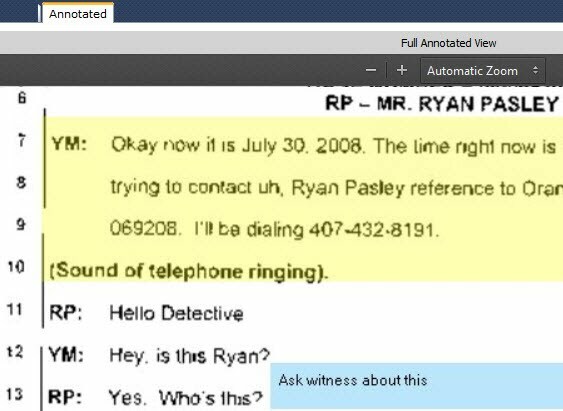 This feature allows attorneys and others doing case review to highlight and create text notes in the PDF's version of any files, without affecting or automatically modifying the original. This can be used to mark-up documents for witness examination, annotate deposition transcripts and other documents and for other purposes. This will help prepare for cross-examination, working with experts, handling objections, assisting witnesses and saves time and preparing transcripts. When you open the Annotation Editor page, you will see the message 'Annotation images are being created.' Refresh the current page and as result of that button click event, it will safely open only the file to be annotated. >Please also note that once you apply annotation to a document, it goes back into the queue and will not allow further annotations until it is done applying current ones. >Once the text or graphic has been saved, you can click on the 'Save Annotation' button and the area selected will display the annotation in a yellow highlight area. From the Browse and Search pages you can display the built-in field 'IsAnnotated', and also apply filter to view only the annotated version of the documents 'Show Annotated Only'. You can use the 'Download Briefcase' feature to download and print annotated documents from the Search, Browse and Document Viewer pages. 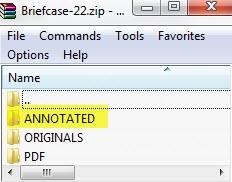 The briefcase downloaded will include a sub-folder entitled 'Annotated' in addition to the Originals, PDF and Redacted (if applicable). You can also upload PDF files previously annotated/highlighted outside of Lexbe eDiscovery Platform with Acrobat Pro or another desktop annotation tool, by choosing the 'Upload Manual Annotation' button. Please note that if annotated document versions of the same file already exists, uploading a new annotated PDF will overwrite existing annotated documents. For more details please follow our instructions under the Manual Annotation page. We also offer eDiscovery Consulting and Technical Services if engaged to support your annotation efforts by helping to design annotation protocols and executing specific requests for document identification. Please contact your sales rep or our Support Center if needed.